When did salt start becoming something you not only douse your savory food with, but also your sweet? Now, scientifically speaking, I know that salt does something in the baking process to make sure everything works correctly – but salt sprinkled on top of sweets is something more recent. I don’t remember when I was little eating salted caramel – or salted chocolate. I do remember loving chocolate covered pretzels though. My first taste of chocolate covered pretzels was at a store I worked at in high school. This store sold a little bit of everything – gifts, cards, jewelry, invitations, stickers, and even sweets. Every once in a while we couldn’t stand it, and we would break open a package of something delicious – for me it was even more of a treat since I was not allowed sweets at home. Those chocolate covered pretzels were my favorite – that salt with the sweetness of the chocolate was such an interesting combination. I make chocolate covered pretzels every year around the holidays (rocky rods), but for some reason when I made this cake, I thought of my first taste of salted chocolate. This recipe came from Cooking Light, and I followed it exactly. The cake was so nice and fluffy – and the frosting was perfect – just a thin layer of ganache with the salt on top made you keep coming back for more. Coat 1 (9-inch) round cake pan with cooking spray; dust with 2 teaspoons flour. Weigh or lightly spoon 5.3 ounces flour into dry measuring cups; level with a knife. Combine flour and baking powder in a bowl; stir with a whisk. Place 1/2 cup sugar and 1/4 cup butter in a large bowl; beat with a mixer at medium speed until well blended (about 5 minutes). Add egg; mix well. Add flour mixture to sugar mixture alternately with milk, beginning and ending with flour mixture. Stir in vanilla. Beat egg whites with a mixer at high speed until foamy using clean, dry beaters. Gradually add 3 tablespoons sugar, beating until stiff peaks form. Gently fold half of egg white mixture into flour mixture; fold in remaining egg white mixture. Grate 1/2 ounce chocolate; fold grated chocolate into batter. Pour batter into prepared pan. Bake at 350° for 23 minutes or until a wooden pick inserted near center comes out clean. Cool in pan 10 minutes. Remove from pan; cool completely on a wire rack. Chop the remaining 2 ounces chocolate. Combine chopped chocolate and 1 tablespoon butter in a microwave-safe bowl. Microwave at MEDIUM 1 minute or until chocolate melts, stirring every 15 seconds. 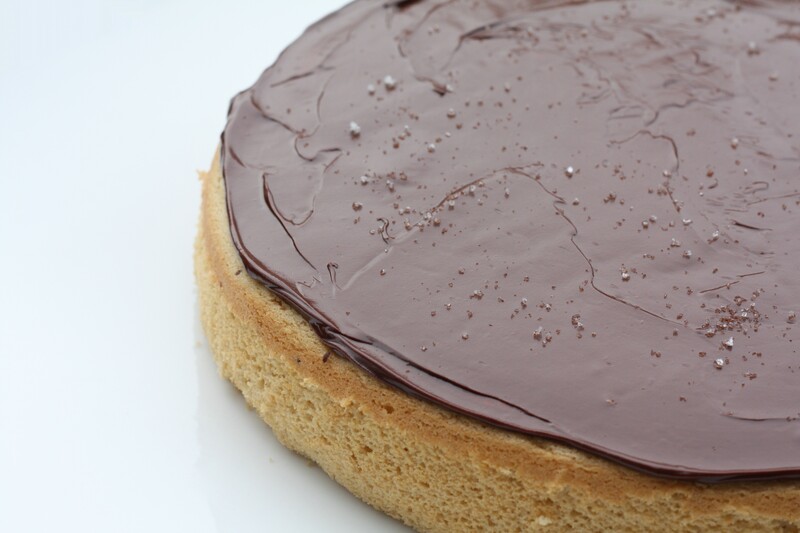 Spread chocolate mixture over top of cake; sprinkle evenly with sea salt. Cut into 8 wedges. I had this amazing chocolate tart the other night at a restaurant. It had a sprinkling of sea salt AND a drizzle of extra virgin olive oil on it. Incredible tasting! I think the salt really helps cut the sweetness and gives chocolate more complexity. The olive oil just adds to the luxuriousness. I’m making this for my next dinner party!